Baymont Inn offers many full-service amenities and features, including a free deluxe continental breakfast with hot items, free local calls, free coffee, WIFI and business center. Guests are invited to work out in the fitness center and relax in the seasonal outdoor pool. Families with children will appreciate the kids pool. 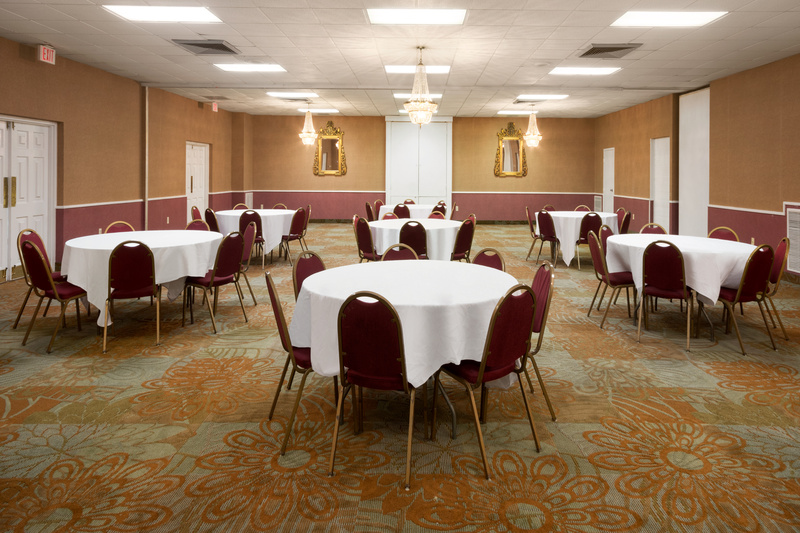 Meeting Facilities: 3 meeting rooms (total of 2,400 square feet). Surrounded by beautiful mountain views, the Baymont Inn & Suites is ideally located off Interstate 81, just minutes from downtown Salem and Roanoke. This Salem hotel is close to popular area attractions, including the National College of Business & Technology, Roanoke College, the Mill Mountain Zoo, Dixie Caverns and Pottery Shop and the Berglund Center (previously Roanoke Civic Center). The Roanoke Regional Airport / Woodrum Field is just seven miles away. Visitors will enjoy browsing the stores at Valley View Mall. Golf courses, tennis courts, movie theaters and putting greens are just minutes away. Several restaurants and cocktail lounges are also nearby. Group Tour Services available. DescriptionThe Commonwealth Room partitions down to three separate sections with doors to each at 20 X 40 sq ft space for each section or 2400 sq ft for entire room. There are 2 wall cabinets which can open or remain closed and inside each is a pull-down screen and chalkboard. When room is partitioned, 2 of the spaces have access to this amenity. There is access to a kitchen directly from the room and kitchen is available for rent to prepare & store food, not for cooking. The Reception Room is 60 X 30 sq ft and there is a door between both meeting spaces if needed to convert into 1 room with 4500 sq ft of space. The Reception room has built in booths in the back which seats 35 ppl and other tables can be added to seat 75 ppl total. There is an upper and lower floor, a semi functional bar and access to outside or pool area directly from the room. Outside area with large gazebo available for rent and great for outdoor weddings, reunions with grilling, child's party with room for large inflatables. Space NotesWe provide Set up and Clean up for all occasions for a very small fee. Tables and Chairs are included in each rental price. Optional items available for rent are; tablecloths, dance floor, kitchen, podium, microphone, dry erase board, overhead projector, a/v cart, extension cord, easel, drawing pads, highlighters and markers Event name can be put on Marquee board inside or on the outside sign. Nonrefundable deposit required to book events. We allow guests to bring in their own food or caterer. A DJ, small band, speakers, etc,. are all allowed but there are time restrictions so be sure to ask. Attendees of events get special sleeping room rates and discounts. Outdoor spaces available for rent but we do not allow our chairs or tables to be put outside. We recommend Aztec rental for tents, chairs, tables, etc,. Alcoholic beverages are allowed to be drank and served with approval from ABC and a temporary 1 day license may or may not be needed.